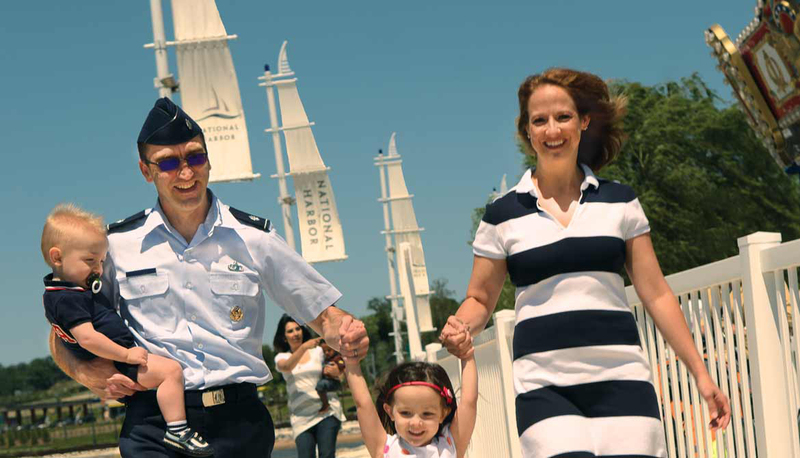 With discounts on some of National Harbor’s best dining destinations and activities, our troops have plenty of ways to spend quality time with their families, whether it’s a casual meal after a day of sailing or a quieter evening over wine for two. Committed to providing an iconic, all-American experience, we’re honored to offer the following specials exclusively for the military. 10% off for military with ID, excluding White House ornaments. Monday – Friday, Bobby McKey’s supports our Armed Forces by waiving the cover charge & offering 20% off food and drinks (one tab per ID.) In a small effort to thank you for your service, we’ve made it a little easier to have a good time. Show your military, fire fighter, or police ID and get free entry (standing room only on Friday). Every Thursday, all active and retired military personnel receive a 10% discount. FREE small coffee with the purchase of any breakfast sandwich. FREE Happy Meal with the purchase of any Extra Value Meal, Premium Salad, or McWrap on HOLIDAYS (Memorial Day, Independence Day, Veterans Day). Military Special – MVP Program. MGM Resorts recognizes the exceptional sacrifices and efforts of those who serve in our armed forces. To show our gratitude, MGM Resorts has created a special “Military & Veterans Program” (MVP). The program is available to any active duty military, members of the National Guard & Reserve, retired military, prior service and spouse of eligible military personnel. MVP members receive special discounts on rooms, restaurants, shows and attractions. We’ve also created a special MVP M life Rewards card that gives an automatic upgrade to Pearl status and the benefits that accompany that M life Rewards tier. 20% off your entire purchase for military personnel. 10% off for National Harbor employees, residents, and military (proper ID required). 10% discount for residents, military, firefighters, and police officers. 10% discount to all Government employees with a valid ID on food purchases only. The discount will last until the Furlough is lifted . 10% room rental discounts available for military (*excludes holidays, not in conjunction with other discounts). 50% off on services for active-duty military, police officers, and firefighters. 10% military discount (offfer does not apply to all services and offerings, including notary, USPS items/shipping, DHL shipping). 10% military discount with valid ID.